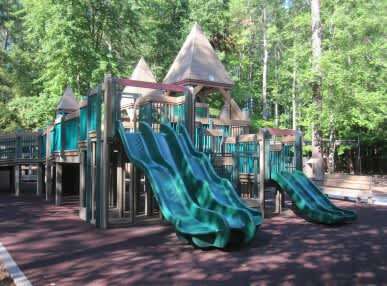 On three acres of City Park is Fun Forest, the ultimate children's playground, imagination center and family adventure area! Built by over 1,800 volunteers from private, public, and community sectors, open since 1995, and winner of the Virginia Recreation and Parks Society "Best New Facility in Virginia" award in 1996, the playground has an older children's area which encourages gross motor-skill development and features a dragon, three-way underground telephone, shaky bridge, dolphin tunnel slide, and many more challenges for the older children. 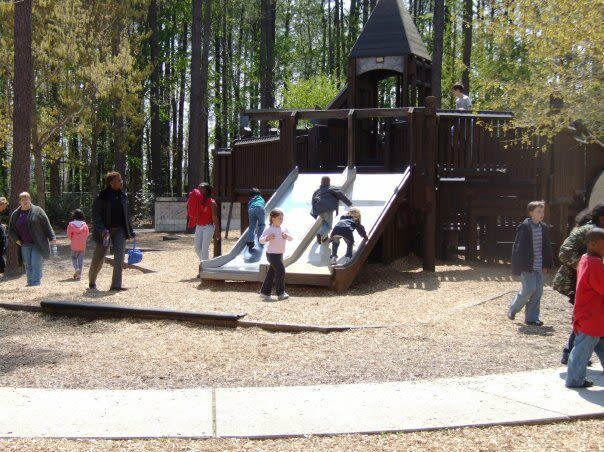 The toddler playground invites little ones to steer a plane or truck, swing, slide and more. Includes a Children's Fossil Dig - a dinosaur buried in a pit under sand scattered with "fossils". The aquatics area where you'll find turtles, sharks and a whale for climbing.